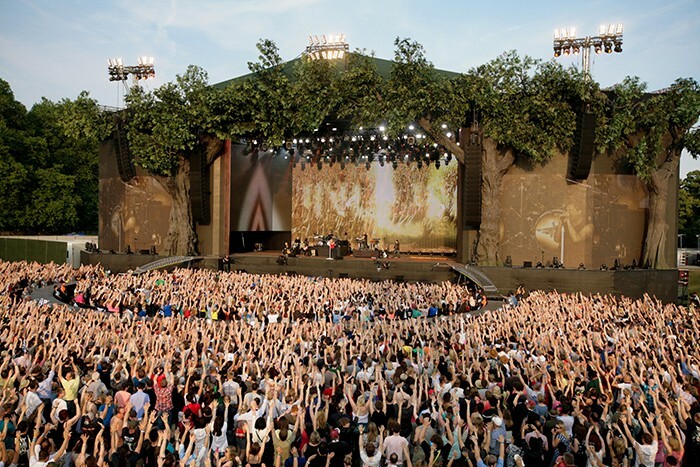 A revolutionary sound system and reoriented stage provided the perfect recipe for the AEG-Barclaycard British Summer Time festival at London’s Hyde Park, as Bon Jovi and the Rolling Stones kicked off the ten-day season attracting crowds of 65,000. Historically, Hyde Park concerts have been dogged by offsite noise pollution leading to neighbourhood complaints and the need to reduce sound levels on site — meaning that the audience couldn’t hear the performances. So new tenants AEG/Loud Sound adopted Martin Audio’s award winning Multi-Cellular Loudspeaker Array (MLA) system to help solve the problem. Knowing that its advance level of control would be the only scientifically proven system capable of maintaining an offsite level beneath the stipulated 75dB(A) threshold, there was the equal confidence of being able to raise the levels up by as much as 6dB from previous years to around 100dB(A) within the audience area, ensuring that the entire audience was united in the experience. These figures were verified by Ian Colville, technical manager of Capital Sound, who designed and supplied the complete audio infrastructure. He had nothing but praise for the MLA system that allows a site to be mapped and areas optimised for audience, non-audience and ‘hard avoid’ entirely. As a result, neighbourhood complaints were reduced to an absolute minimum. 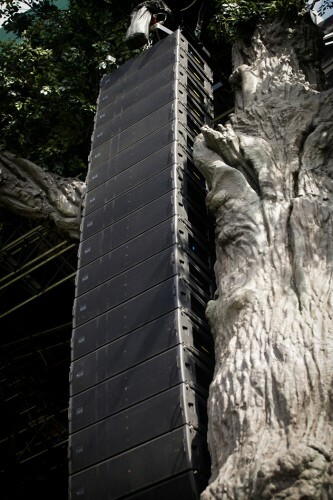 Loud Sound had already received categorical proof of MLA’s wizardry at the 2011-2013 back-to-back Underage, Field Day and Apple Cart Festivals in Hackney’s Victoria Park, serviced by Capital Sound. Immersed in a densely populated neighbourhood (as with Hyde Park), according to the event management, complaints about noise escapement suddenly ceased. 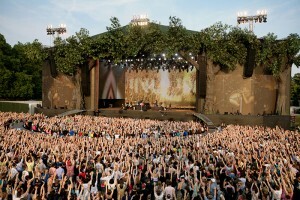 This gave Loud Sound, the site managers for AEG, the evidence that MLA would be a perfect tool for the Hyde Park concerts. But given the sensitivities of noise thresholds in the Royal Parks, a site simulation was first set up at Hatfield House in Herts for the promoters and acoustics consultants Vanguardia Ltd — who routinely carry out measurement and analysis at outdoor events such as this. Ian Colville and Martin Audio R&D director Jason Baird confirmed that this location was chosen because of its similarities in shape and size to the Hyde Park site, and evaluation took place against other systems. The Martin Audio system is unique in its ability to place the sound only where it is required — unlike conventional systems, which have largely depended on trial and error. As a result the sound coverage pattern can be programmed into Martin Audio’s breakthrough MLA software to guarantee sound containment. Vanguardia recorded near- and far-field measurements and asked Martin Audio to load in two different presets, which set coverage at 100m and then 50m. The measured SPL data over the site was then fed into their own environmental model before giving the system the thumbs-up. Vanguardia’s experience with MLA also caused them to believe that a better offsite sound could be achieved than with a conventional system. With its rapid loudness drop-off, the MLA system was created for environments such as Hyde Park. According to one sound engineer, who had earlier worked with the system. the ability to ‘taper off’ the sound at the perimeter “is as if an invisible ring has been drawn around the site.” It was this that will have impressed those monitoring the offsite sound at typical nearby locations such as the Grosvenor House Hotel on Park Lane. So how was the Hyde Park system conceived? Sculpted into the oak shrubbery of the concept stage’s proscenium — the inspiration of set designers MDM working with Star Rigging — were left and right hangs of 16 MLA elements (with a single MLD Downfill box at the base). Outfills were provided by 12 MLA (and a single MLD each side) with eight pairs of the small footprint Martin Audio W8LM Mini Line Arrays for front fills. In addition there were ten delay masts. The front two arcs of four MLA masts each contained seven elements and a single MLD. For the larger shows, two further delay towers at the back were enabled, made up of eight MLA Compacts. Critical distances were 50 metres (from FOH to stage), while the delays were set at 90m (from the stage), 160m and the 210 metres (for the MLA Compacts). In addition to system designers, Ian Colville and Martin Audio R&D director, Jason Baird, Capital Sound’s support team included Al Woods (crew chief), Toby Donovan (system engineer and MLA technician) and eight other crew. Account manager was Martin Connolly and project assistant was Michele Conroy. Andy Davies and Chris Pyne, from Martin Audio’s Tech Support team, also supported the event.